If you're ready to amplify your gaming experience with a healthy dose of style and performance, you really can't do much better than the OCZ Sabre OLED Gaming Keyboard. 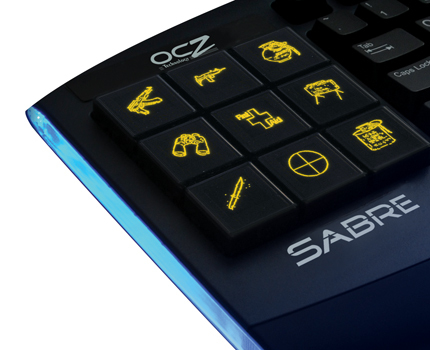 Featuring nine dynamic OLED (Organic Light Emitting Diode) user-programmable hot keys, the OCZ Sabre can easily convert any digital image or text into distinctive LED keyboard icons. This incredible feature reminds the user of the personalized shortcut, thus offering quicker access to the hot keys. Thanks to the enhanced software that comes with the OCZ Sabre OLED Gaming Keyboard, even the most conventional online experience will be turned into a balls-out state-of-the-art affair. It's innovative software allows the user to map sets of simple or complex commands to each OLED, and holds the power to store an unlimited amount of shortcuts and macros. Make no mistake, this is one keyboard that's tailormade for true gaming aficionados, CAD professionals, and competitive enthusiasts. Merging a perfect blend of style and comfort, the OCZ Sabre OLED Gaming Keyboard offers the customization the pros look for in a high-end peripheral. If you want simple plug and play usuability, gorgeous illumination, and limitless commands and macro configurations, pick this keyboard up and get it your desktop immediately.